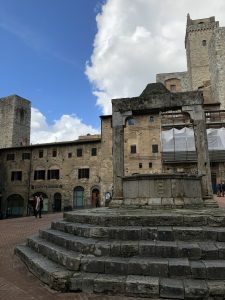 I will be discussing a day excursion I went on through SAI to San Gimignano. It is a small hilltop city in Siena, Tuscany surrounded by ancient walls and known for its medieval towers. When I walked through on of the gates leading into the city, I could feel the history in the walls as our tour guide walked us down the street towards the Piazza della Cisterna. This opened up into a wide cobblestone space with a well in the center. This was one of my favorite parts of the tour because when we walked up close to the well I noticed all of these ruts in the side on the well going all the way around the rim. 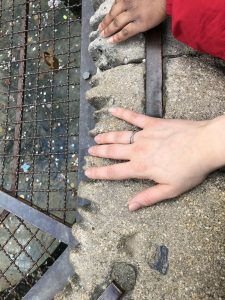 Then our tour guide made it a point to explain these cut marks in the stone are from centuries of erosion the people would pull their buckets up from the well every day. Eventually, these carving became deeper and deeper. Parts of the well that wasn’t reconstructed dated back to the 1300’s. I am a huge history lover, so the thought of people centuries ago getting water for the day and standing in the same place thrilled me. The towers were also a very historical landmark, setting this town apart from many other Tuscan towns. San Gimignano still possesses 14 of its 70+ towers. This is no small feat when combated with war, natural disaster, and gentrification. These towers are now protected landmarks of the city. When we walked up closer, you could see the holes and indents where they would fashion a platform above their enemies during times of war to protect their city from invaders. 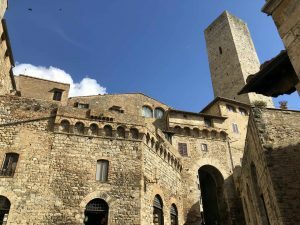 This city was one of my most favorite cities in Italy to visit thus far because it still had so many original Romanesque and Gothic architecture and the lookout points in the city offered a breathtaking view of the Tuscan hills. I recommend anyone staying in the region to visit because it is a city I will not soon forget. Sarah is a SAI Florence spring 2018 student from Carroll University.